Federal environmental protections are actively being undermined and overturned by our elected and appointed officials, presenting us with significant challenges, and emerging opportunities, for the development and utilization of community science and civic technologies. As the EPA's proposed budget for the upcoming fiscal year is nearly one third lower than in recent years and guts research and enforcement funding, we must acknowledge that environmental monitoring is not synonymous with environmental protection or intervention. Moreover, low-cost indicator species monitoring is not a direct avenue to protecting ecosystem and human health. However, relying on the regulatory state has always been insufficient to truly protect ecosystem and human health too. With our current environmental governance landscape, I think we need a multifaceted approach that includes public-private partnerships to harness the utility of community science for environmental protection. The clarity of the federal deregulation agenda (e.g. Executive Order 13771) highlights challenges for the public writ large, and community scientists in particular. As federal laws are reversed or become too challenging to enforce, the model of community collected data prompting further investigation and enforcement by environmental agencies may not be as feasible as seemed plausible after the 2015 Office of Science and Technology Policy memorandum urging agencies to embrace citizen science. However, there could be a glimmer of opportunity as environmental agencies seek to continue environmental data collection: explicit partnerships with community monitoring organizations may become a more viable, mutually beneficial model for maintaining and improving spatial and temporal monitoring resolution amidst enormous agency budget cuts. We need eyes, ears, sensors, and samplers out there, and our technological developments and large population can be resources. There is plenty of work to do to actualize this opportunity, potentially leveraging government and academic institutional resources with the reach of an engaged public seeking greater control of environmental management. The likelihood of public-private partnerships using community monitoring will likely vary by state, or even by zip code. With federal deregulation, there is likely to be a growing disparity between states' environmental laws. This is already evident, for example, in greenhouse gas emissions reductions, with fourteen states and one U.S. territory forming the U.S. Climate Alliance, wherein member states maintain commitments to the Paris Climate Accord, while the federal government has officially withdrawn from that global agreement. As state environmental laws diverge, it's possible that the challenges, opportunities, and responsibilities of community science practitioners and supporters may vary among states. Another key variable is public perception of science and of environmental protection, which also varies geographically. With concerted efforts and anti-science political rhetoric over the last twenty years, there has been increased public mistrust of science and scientists. Engaging more people in the development and utilization of civic technologies, and emphasizing science learning in that process, may provide avenues to greater understanding of and trust in science that is not couched in political bias. 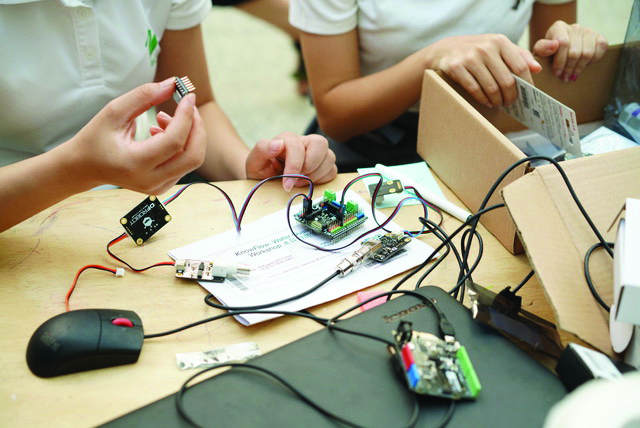 Engaging youth in civic technology development and utilization may be an effective avenue for ultimately engaging adult populations across greater geographic, political, and socioeconomic spectra. In addition to building public-private partnerships and leveraging social pressures that tend to fall along geographic lines, we community science practitioners may need to turn our immediate attention to direct intervention strategies where feasible. Developing accessible remediation and exposure mitigation techniques for common toxins is essential for withstanding an uncertain future of federal environmental governance. Exploring the sorbent capacity of biochar for contaminated water, air, soils and sediments could yield great results. Utilizing a variety of plants for phytoremediation of contaminated soils has already had great success in pilot studies. Further developing these sorts of lowcost interventions may have some of the highest return on investment of our community science endeavors. The changing environmental governance landscape, largely undermining the regulatory state we've grown accustomed to, presents both challenges and opportunities to community science. Acknowledging these formidable challenges, let's leverage them in enhancing public engagement and control in our environmental management. 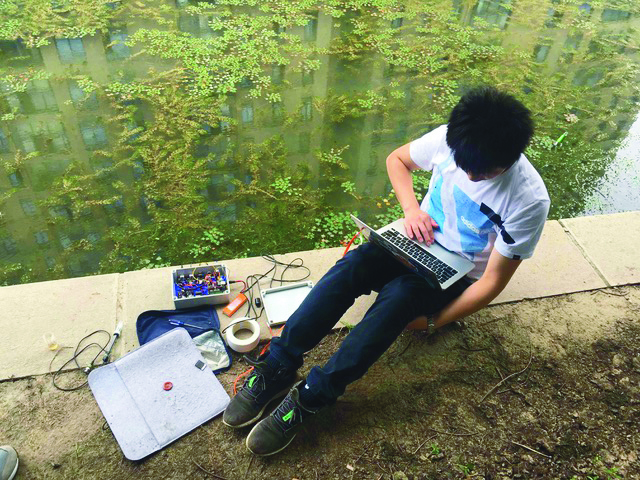 Photos: Building and using the KnowFlow water sensor to measure a variety of water quality parameters. Photos by Shan He.